Sophomore forward/midfielder Bridget Settles scored five goals in the last two games, including three in Sunday’s 3-0 win against Penn. Hats off to sophomore forward/midfielder Bridget Settle – literally. KRISTON BETHEL TTN Senior forward Mandi Ruth dribbles past a Stanford defender Friday. 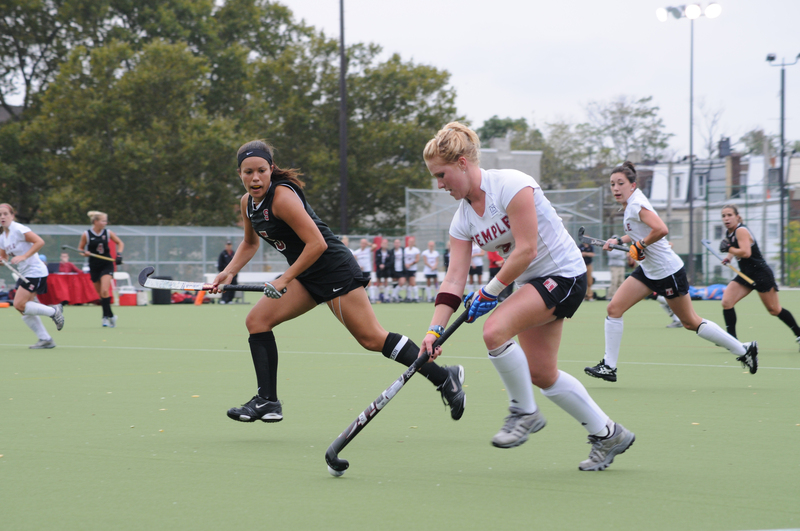 Ruth netted an assist in Sunday’s 3-0 win over Penn. Field hockey fans at Geasey Field threw some headware onto the field at the 38-minute mark in the second half of Sunday’s game against the Penn Quakers, as Settles netted a hat trick with her third goal of the game. The Owls (4-9) broke a six-game losing streak with the 3-0 win. Settles, who scored Temple’s only two goals in Friday’s 7-2 loss to No. 14 Stanford, praised her supporting cast, which she said stepped up big in front of the 300-person crowd. Senior midfielder and captain Charise Young plugged the middle of the field while playing both sides of the ball. She put her name on the scoresheet with a pass from the left side of the circle that Settles found for the put in. Senior forward Mandi Ruth also turned heads with her play, as she had two scoring chances of her own. Ruth dribbled her way through Quaker traffic to find Settles for what was the only goal needed to put away Penn. She continued her stellar play by blocking shots and rattling a shot off the goalpost. Sophomore midfielder Becca Keener and senior defender Kristen Wanner completed an all-around defensive effort that coach Amanda Janney praised after the victory. The main key to defensive play starts in the net, where junior goalkeeper Sarah Dalrymple recorded her second career shutout. Like Settles, she credited the work of her teammates. Janney agreed and emphasized the play of Dalrymple and Settles. The Quakers had almost no time on attack in the second half, while Temple picked apart their defense. The shots that Penn got on goal, Dalrymple tossed away with ease. She needed to make only one glove save. Atlantic Ten Conference play starts Friday with Saint Joseph’s at Drexel’s Buckley Field, where the Owls are 2-2 this year. Janney said she expects big numbers on the scoreboard. The 1986 Heisman Trophy runner-up is the first Temple player and fourth former Owl to earn induction.